South China’s sub tropical climate is the perfect environment to push the envelope for naturally cooled architecture. 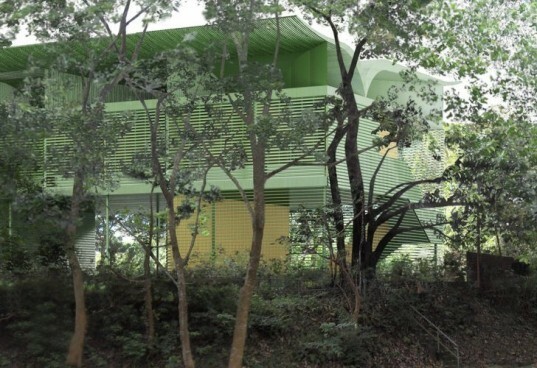 Zoka Zola Architects fully intends to maximize the art and science of natural cooling as they unveil a hostel that is fully ventilated using only prevailing breezes to keep occupants comfortable. The aggressively flared roof and carefully designed air shafts scoop up prevailing breezes and transfer the currents throughout the building. 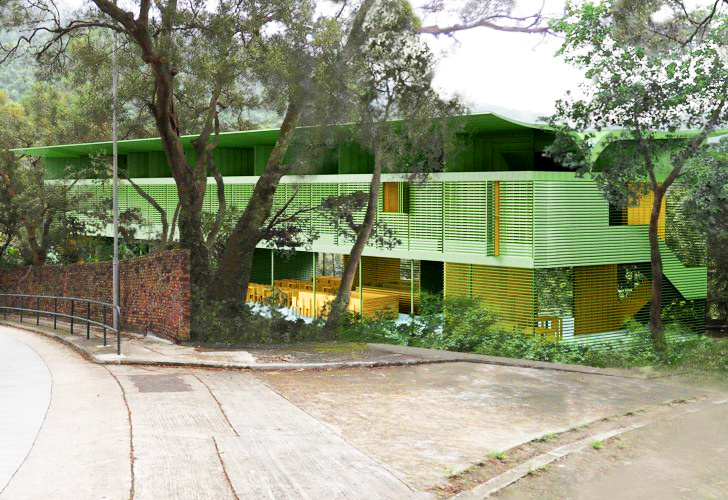 Made from locally grown bamboo the project aims to be the greenest building in Southern China. The hostel will be a corporate retreat and training center but the developer also wants to push the limits of green design. The 24 bedrooms are all set on an upper floor which is fed fresh air by an aggressive wind scoop system built into the roof. Designed in conjunction with Arup Engineering , the roof directs the prevailing winds and pushes them into the core of the building, providing each room with cooling breezes. The lower floor will be the community area with a restaurant, conference space and indoor/outdoor area tucked below the sleeping quarters. Humans are kept comfortable not only by cooled air but by moving air which draws heat off our skin. In fact natural breezes provide comfort in rooms that are much warmer than typically tolerated. By carefully incorporating the natural wind patterns of the site the building is designed to accommodate the changing wind conditions. The aggressive flared roofline on either side of the building efficiently captures the moving air– which is then transferred throughout the second floor using large plenums. The air exits out again through an open grid floor to the open space below. During the day southerly breezes come from the ocean and in the evening cool northerly winds come down the forested slope and wash across the building. The roof also acts as a buffer from solar gain. Sunlight will be carefully controlled to bring in diffused lighting while avoiding direct solar heat. 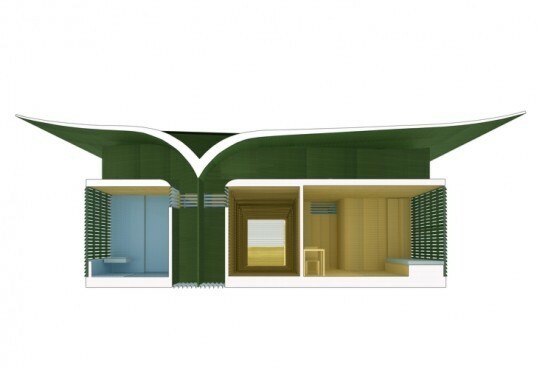 The building is made mostly from bamboo, an indigenous grass to Southern China and a excellent building material. The copious use of the traditional building material is intended to help bring bamboo back as a contemporary choice in low rise buildings. Furniture and finishes will also be made from the versatile grass. it's a wellcome development. i believe this will get international approval. meanwhile, can you design two bedroom apartment for me, including the construction? This is a pretty seductive building. Aesthetically interesting and approachable with the trebled value that comes from being beautiful, sustainable and efficient. I would not be surprised to see this building receive recognition from the international architectural community. It's a new benchmark in sustainable design to my eyes. The Hostel is to be a corporate retreat and training center but the developer also wants to push the limits of green design. The 24 bedrooms are all set on an upper floor which is feed fresh air by an aggressive wind scoop system built into the roof. Humans are kept comfortable by not only cooled air but by moving air which draws heat off our skin. In fact natural breezes provide comfort in rooms that are much warmer than typically tolerated. Designed in conjunction with Arup Engineering Hong Kong the roof directs the prevailing winds and pushes it into the core of the building, providing each room with cooling breezes. The lower floor will be the community area with a restaurant, conference space and indoor/outdoor area tucked below the sleeping quarters. By carefully incorporating the natural wind patterns of the site the building is designed to accommodate the changing wind conditions. The aggressive flared roofline on either side of the building efficiently captures the moving air-- which is then transferred throughout the second floor using large plenums. The air exits out again through an open grid floor to the open space below. During the day southerly breezes come from the ocean. In the evening cool northerly winds come down the forested slope and wash across the building. The roof also acts as a buffer from solar gain. The building is made mostly from bamboo an indigenous grass to Southern China and a excellent building material. The copious use of the traditional building material is intended to help bring bamboo back as a contemporary choice in low rise building. Furniture and finishes will also be made from the versatile grass.